Keeping track of your blood pressure is one important step to maintaining heart health as you age. But taking an accurate blood pressure reading isn't as easy as it may look, and mistakes are common. Follow these seven steps each time you measure your blood pressure to make sure you have the most accurate reading possible. Always make sure your equipment is working properly. Your blood pressure gauge and cuff should be in good shape with fresh batteries. If you are using a manual blood pressure gauge, make sure your stethoscope is clean and working well. Blood pressure can rise and fall depending on our body's state. If you are nervous, anxious, or agitated, your blood pressure will rise, which could create a false alarm. Take a few moments to relax quietly before taking your blood pressure: Have everything ready, sit down and breathe. The blood pressure cuff should fit over about three-quarters of your upper arm. It should easily go around your arm and the Velcro should close tightly. If your cuff doesn't fit properly, you're more likely to get an inaccurate reading. When taking a blood pressure reading, your arm should be at the same level of your heart. If your arm is positioned higher than the level of your heart, your reading may be falsely low. If your arm is positioned below the level of your heart, your blood pressure reading may be falsely high. Sitting with your back supported and feet on the floor is the best position for an accurate reading. Do not move around while taking your blood pressure and leave your legs in one position. Breath deeply and calmly. Too often the person having their blood pressure read, a nurse or a family member tries to remember the blood pressure and record it later. However, this can lead to many errors. Instead, make sure that you or another person taking the reading writes down your blood pressure immediately, and that it is copied directly from the blood pressure gauge. 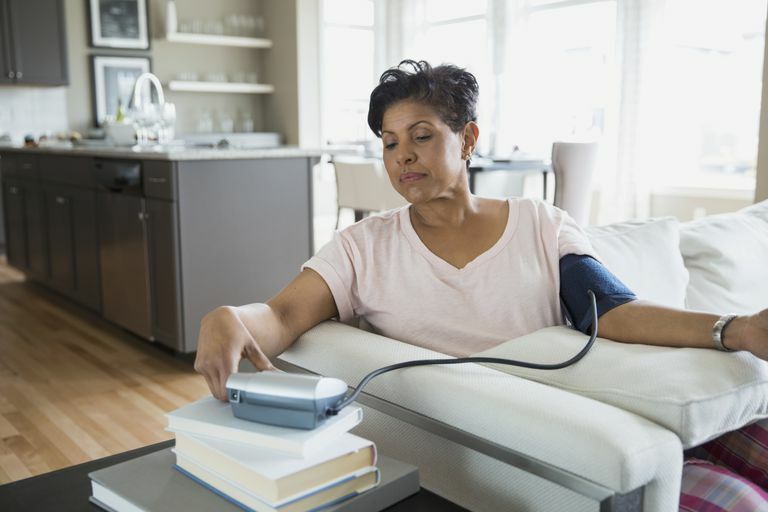 Even if you are seeing a doctor regularly, it's a good idea to take your blood pressure at home on a regular basis. There are many things about seeing a doctor that can cause a change in your blood pressure, including anxiety; anger about forms, payment or a long wait time; walking across a parking lot or time of day. Take your blood pressure routinely at home and keep a log. Then bring your log with you when you see your doctor and speak up if the office readings are different from your home readings.